Heart-Pounding Scares Await this Halloween Season at Haunted House of Horror! AlabamaHauntedHouses.com recently sat down with Brian Knipper of Haunted House of Horror, to discuss what's new at Haunted House of Horror for the 2018 Halloween Season! Located in Courtland, Haunted House of Horror is stirring up some serious scares for this haunting season. Thrill seekers won't want to miss out on what's taking place, read below for all the scary-good details! What's new at Haunted House of Horror for 2018? Do you have any new rides, attractions, or special features that Haunt Seekers should know about? Well, we would not want to give away all our secrets, but I can tell you that there will be more Q line entertainment as well as some changes inside the haunt that will absolutely shake our customers to the core! We are very excited about this season for several reasons , we have new energetic actors and artist that are going to make this one of the best years yet as well as changing some rooms around to make it even creepier than any past season yet. What differentiates Haunted House of Horror from other local haunts in Alabama? We have a very large haunt with a small mom and pop attitude. All of our staff as well as myself and my partner talk to as many customers as possible to make sure they get more than what they have paid for .We will not let one person leave without the best experience possible!! How long has Haunted House of Horror been in business? Can you tell us a bit more about Haunted House of Horror's history? Haunted House Of Horror started in 2011 in the Old Courtland High School. At 40,000 square feet it was one of the largest in the south east. We are now up to 54,0000 square feet. What's your favorite experience since opening Haunted House of Horror? My favorite part is opening night and hearing all the screams and laughter as they are taking the tour and come to realize that all the hard work, late nights, blood, sweat and tears were worth it! How long is a typical haunt experience at Haunted House of Horror from start to finish? Depending on if they are running or going at normal speed its usually anywhere from 30 to 40 minutes. On a scale from 1 to 10, how scary would you say Haunted House of Horror is? Why? 12!! We pride ourselves on making sure that this place lives up to its name! It's a haunted house and a very scary one. We want your blood pumping and sweat pouring. Does Haunted House of Horror's property have any real haunted history? Do you have a spooky encounter you'd like to share? Absolutely, this property is sitting on the location of a fair size civil war battle as well as the principle of the school himself taking his own life. We have had too many experiences to list with lights coming on and props going off by themselves as well as footsteps and voices heard while we are out here working in the off season. We have had a paranormal group out here on a few occasions this off season to investigate and they have collected some good eerie stuff while they were here! I have always loved fall and the Halloween season and I guess what started as a small time hobby has turned into a big time hobby with larger toys to play with. How has new technology (i.e. animatronics, special props, etc) helped you to enhance Haunted House of Horror? It helps tremendously because the more we can take someone out of their element of security and put them in a totally different world with a large monster coming out of the wall or a zombie coming up out of the ground. If you have a fear of any kind we will find it. Can Haunted House of Horror accommodate large groups? How many people can experience Haunted House of Horror together as a group? Yes we can. Typically we like to put groups of 6 to 10 through with no problems. Does Haunted House of Horror offer any special deals, discounts, or coupons? We have group discounts as well as discount coupons. We also give away tickets on our Facebook page. 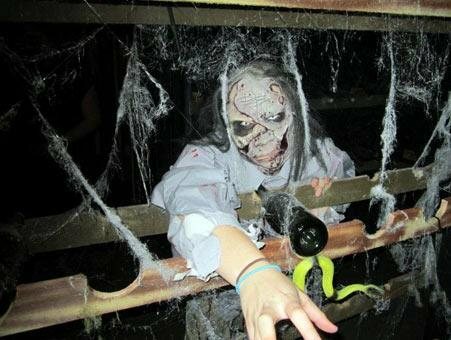 Anything else you'd like to let us know about Haunted House of Horror? We just want people to know that if they attend one haunt this season give us a chance and I promise you you will not be disappointed! !